INDUSTRY.co.id - Tojo Una Una - Ministry of Agriculture (Ministry of Agriculture) through the Agricultural Quarantine Agency (Barantan) officially opened a quarantine service in Ampana, Tojo Una-Una Regency, Central Sulawesi. This is in line with the instruction of the Minister of Agriculture Andi Amran Sulaiman to encourage acceleration of quarantine services in the centers of superior agricultural commodity production that have export potential. In addition to improving surveillance of agricultural commodity traffic between areas, quarantine services in Ampana also encourage health and safety certification of agricultural commodities required by export destination countries. Barantan is committed to guaranteeing the traffic of healthy, safe and pest-free agricultural commodities. As a trade facilitator, we encourage the agribusiness sector primarily to fulfill sanitary and phytosanitary (SPS) standards or product health and safety guarantees from export destination countries, "said Antarjo Dikin, Head of Nabati Barantan Plant and Biosafety Center, Ministry of Agriculture when inaugurating the Service Office Quarantine of the Ampana Work Area, Monday (09/17/2018). Antarjo said that the agricultural potential in Central Sulawesi showed a significant increase trend. From the data from the quarantine traffic information system owned by Barantan IQFAST, there is an increase in the type and volume of animal and plant traffic in Central Sulawesi Province, including in Ampana Regency both for inter-area and export. In the period 2018 to August, there was an increase in the number of swallow nest commodities, donggala cattle, pine resin, corn and wooden containers. It was noted that the trend of increasing bird nest traffic in 2017 had a frequency of 682 times, 26,762 tons compared to 2018 to August with a frequency of 550 times, 22,776 tons. The release of prime exports to various countries is also becoming a trend. Up to August 2018 each of the pine resin commodities was 40 times a total of 3,300 tons, wooden containers of 72,000 cubic meters, and corn 3 times with a total of 10,000 tons. Especially for corn, the Minister of Agriculture specifically visited Tojo Una Una Regency at the end of July and saw Ampana Harbor as having a great potential to export corn from Central Sulawesi farmers to the Philippines directly. The inauguration of the Quarantine Work Area was also carried out by releasing exports of 3,900 tons of corn to the Philippines, also attended by the regent of Tojo Una Una, Muhammad Lahay. In his remarks, Lahay expressed his appreciation of the Ministry of Agriculture which continues to encourage the improvement of agricultural commodity cultivation including export acceleration through quarantine services. We hope that the presence of quarantine in the region is able to contribute and encourage farmers to improve the quality of commodities produced to meet international requirements, so that they can compete in the world market, he explained. On the same occasion, Ida Bagus Hary Soma Wijaya, Head of the Agricultural Quarantine Center for Class II Palu, gave up a phytosanitary certificate of corn as a requirement for the Philippines' export destination country. As a health and safety guarantee that the export corn has been examined and is free of pests. This corn export shipment is the third time directly through the port of Mantangisi, Ampana, Tojo Una Una. Previously, PT. Segar Agro Nusantara also exported 2,200 tons of corn and in July of 3,900 tons with the same destination in May 2018. 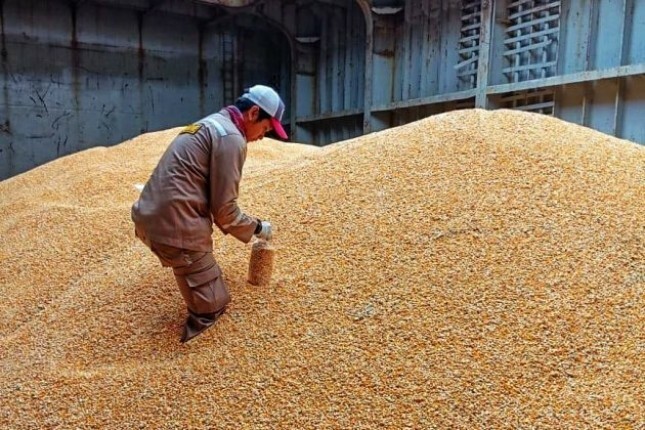 The amount of corn exports nationally completes export data released by the Ministry of Agriculture, it is noted that as of July 2018 14 countries have received corn from Indonesia, the five of which are the Philippines, Japan, Malaysia, Vietnam and Korea. Especially for export destination countries to the Philippines until July it was recorded to reach 290,594 tons, while Japan reached 5,406 tons, Malaysia 4,337 tons, Vietnam 1,159 tons and Korea 376 tons.